Lemonade: a perfect refreshment from the Soviet past. Soviet kids loved soft drinks, even if their flavors wouldn’t compare to the sugary sodas that arrived after 1991. If you happen to be in Moscow and make a visit to GUM, the “department store” on Red Square, you will see a kiosk selling Soviet-style sodas. There will be cone-shaped tubes filled with different flavors of syrup and a separate hose providing the sparkling water. This soda machine, called a “gazirovka,” is there because these kiosks are among the most iconic Soviet things – they feature prominently in movies, old photos and parents’ stories. You can still buy some of their famous drinks like “Tarkhun” (with tarragon) or “Duchess” (pear-flavored) in bottles, although they have been replaced in the soda spotlight by Coke, Sprite and Fanta. In the summers when I was growing up, my brother and I would take an overnight train south to the town of Kursk. There we would spend a few weeks with our dad’s parents, who, although quite strict overall, liked to spoil us in their own way. Their way of doing something special for their grandchildren was to buy us a soda every day. Some days it was Fanta, some days it was Coke, other times we’d get Sprite or 7Up. This last one was a challenge. My poor grandfather, who tried hard to learn English but never quite managed, would ask a shop attendant for “Zoup” which sounds a lot like “tooth.” It was such a treat! At least when I was growing up, Russian kids weren’t allowed much soda. It was bad for you, like chewing gum or Snickers – that vice of capitalism! – and you were only allowed some at other kids’ birthday parties. One time we decided to make our own sodas. Our Kursk grandparents had a machine that could add bubbles to still water. According to Granny, everyone used to have one of those, and then they all disappeared – like “tea mushroom” and iron meat grinders. Our soda-making experiment, adding homemade syrup into the homemade sparkling water, couldn’t compete with the American bottled stuff, however, and after one day we went back to Coke and Pepsi products. Granny has her own experience with Soviet sugary drinks. She says that when she was young, she went to Crimea with a friend whose stepfather ran a small soft drink factory. There they would come in and “just like all the other workers” take part in making soda: they would wash and dry the glass bottles, take one to the semi-automatic machine where a woman would pull one lever to add the syrup, and another to put a lid on the bottle. For this work, the same woman would reward them by pulling the syrup lever twice to give them a double-syrupy drink and would forego the lid so they could get to drinking right away. “It was delicious!” Granny reminisces. Don’t even try getting Coke anywhere near her – this “disgusting thing” she wouldn’t touch. The girls were also given a bag of soda to take on boat trips. “We would buy those mind-blowing tomatoes and the very famous fish baraboulka and some bread, and dip the avoska [net bag] with the soda in the water off the side of the boat and go away for the whole day. That was in 1951.” “1951…” Granny repeated dreamily. That summer in Moscow was the hottest ever. Temperatures reached up to 93 degrees. The records of that summer latest until the horrendous summer of 2010. The summer of 1951 was also considered the beginning of the demise of Stalin, who that year went on vacation to the Caucasus to “look after his health.” Granny was 19, and didn’t know that just two years later she would rush to Stalin’s funeral. She celebrated that day religiously every year well into her 80s. I gave up sugary drinks a while ago and avoid “Tarkhun” and Coke all the same, but this Soviet version of what the Book calls “lemonade” is not that bad for you and tastes good and fresh – I might add that to my Soviet diet from now on. There is a large selection of commercially available ready-made fizzy drinks prepared with natural fruit and berry juices and sugar, including lemonade, cream soda, cherry, apple and other flavors. For those who want to make lemonade at home, take 1 Tbsp. of lemon juice per 1 glass of drink. Add 1 ½ teaspoons of sugar and mix with carbonated water until the sugar is dissolved. 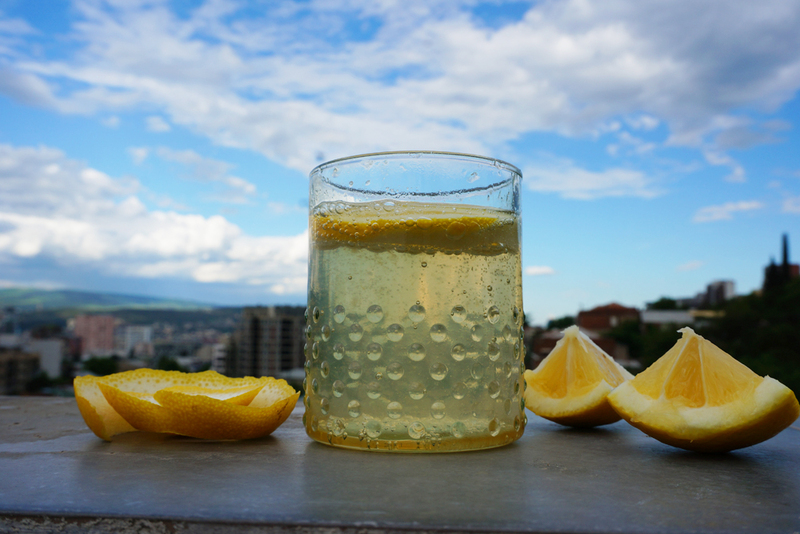 Serve chilled with a slice of lemon in each glass.